With high standards and a passion for education, Pulaski Academy and Central School District Superintendent Brian Hartwell hopes to build on the strong foundation established by his predecessors. Hartwell started his duties as the district’s leader in August, taking over for longtime Superintendent Dr. Marshall Marshall, who retired after a distinguished career. 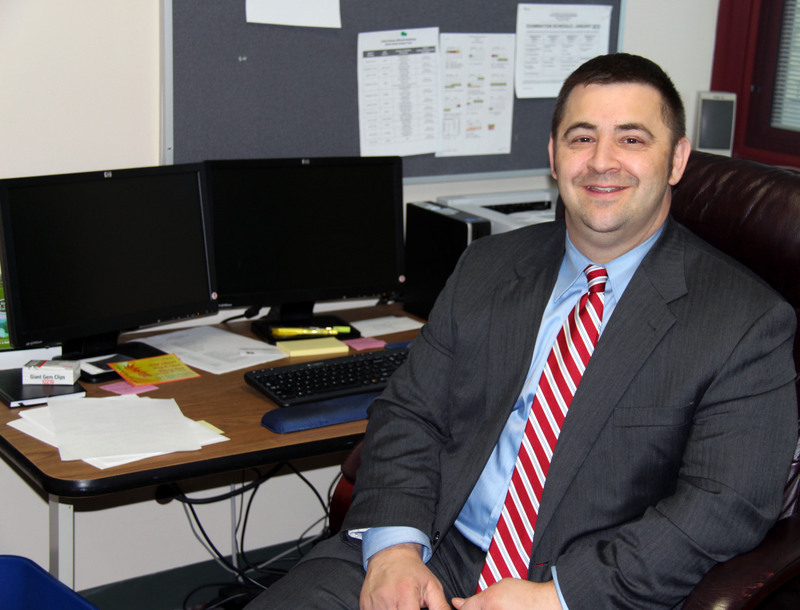 New Pulaski Academy and Central School District Superintendent Brian Hartwell brings high expectations, decades of experiences and a team mentality to the district. While Hartwell humbly noted that he has big shoes to fill, he is confident that his career as a teacher, coach and administrator will be beneficial to PACS. The 42-year-old superintendent has spent nearly two decades in education. He graduated from LeMoyne College in 1995, where he majored in economics and minored in education. Armed with a certification as a seventh through 12th grade social studies teacher, he taught at North Rose Wolcott and Oswego High School. A self-admitted lifelong learner, Hartwell continued his own education at SUNY Oswego, where he earned his Master’s in Curriculum and Instruction and his Master’s in Education Administration. “I realized I had a passion for administration. I really enjoyed my time in the classroom and I really enjoyed my time as a coach, and administration takes a little bit of both,” Hartwell said. For Hartwell, his passion for administration was recognized by the Oswego City School District, and he was hired as an assistant principal and later as executive principal at Oswego High School, where he served until his recent appointment as the new PACS superintendent. Whether he was teaching at North Rose Wolcott, serving as principal in Oswego, or presiding as the new superintendent in Pulaski, Hartwell said he has been fortunate to have worked with many outstanding educators who aided in his success. Although he is still new to PACS, he is already fully immersed in the district and the community. In addition to attending school and community functions, Hartwell is in the process of buying a home in Pulaski. Being involved in the community is just as important as being invested in the students within the district, Hartwell said. “I’m passionate about what I do and I’m passionate about creating meaningful learning opportunities for students – and learning opportunities can happen anywhere; it’s in the classroom, it’s on the fields and courts, it’s on the stage and all the things that are extra-curricular and co-curricular,” he said. That all-encompassing collaborative mentality is reflective of Hartwell’s leadership style. Quoting Aristotle, the superintendent acknowledged that the whole is greater than the sum of its parts. To establish definitive, lofty goals for PACS, the superintendent has instituted a learn-and-listen approach. He is creating an entry plan by interviewing different school personnel, documenting their input on student performance, obstacles, areas of success and areas that need improvement. From an academic standpoint, Hartwell said he is working with teachers to ensure that student achievement remains a priority. With the Common Core Learning Standards firmly in place, Hartwell said he is confident that the district will see continued growth in all subject areas, which will help create college and career-ready students. While education is ever-changing, Hartwell said he has all of the right pieces in places to help meet the evolving requirements – students, parents, teachers, support staff, administrators, faculty and the community.